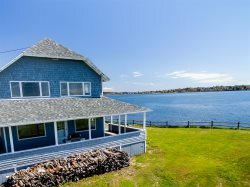 With gorgeous ocean views from nearly every window, Captain’s Point will surely be everything you are hoping to find while staying on the beautiful coast of Maine. The complete wrap around covered porch, with a full compliment of tables and chairs, is the perfect place to dine on your freshly caught Maine lobster. From this prime location, you will have direct access to the ocean with steps from the lawn leading right down to the private rocky shoreline. You can take a quick stroll across the sandy town landing and find yourself at Este’s Lobster House, one of Harpswell’s popular seafood restaurants. Enter the house into the spacious, fully updated kitchen, complete with dishwasher for easy cleanup after meals. Enjoy your meals in either the dining room or sunroom overlooking the water. The wall of windows in the sunroom brings in loads of natural light, brightening the entire home and overall experience. There is a powder room located off the dining room, with a stackable washer/dryer for convenience during your stay. Awaken to the stunning sunrise across Harpswell Sound, which is visible from each of the second floor bedrooms. A full bathroom, with tub and shower, is conveniently located near the bedrooms. Fresh paint, updated appliances, new furniture and coastal decor enhance your experience, without detracting from the comfortable character of this charming seaside home. Chart your course to Captain's Point, for an unforgetable Maine vacation! Check-In: Check-in between 4pm and 5pm on the date of your arrival. If you think you may be arriving later, please contact MaineStay Vacations and we would be happy to make other arrangements for you. Check-Out: Check-out is at 10am on the date of your departure. We kindly ask that all guests are prompt, as our cleaners have many homes to take care of, especially in the summer months. Linens: All properties are supplied with pillows and blankets or comforters, they do not come with sheets and towels. You have the option to either bring your own or rent our linen service. This service provides you with bed sheets, towel sets for the maximum number of guests allowed, bath mats, and kitchen towels. Towel sets consist of a bath towel, hand towel, and face cloth, and you have the option rent more towel sets if needed. The linens are professionally cleaned and sanitized between use. Linens will be provided to you when you check in at our office. Payment: We collect 50% when you reserve and the other 50% is due 30 days prior to your arrival. You will receive a notification via email 3 days prior to the due date as a reminder. We accept Visa, MasterCard, Discover, cash, money orders, traveler's checks, and personal checks. If you pay the deposit with a credit card, we will automatically charge the card on file for the final balance. If you wish to change your form of payment, please don't hesitate to contact us when you receive the balance due notification 3 days prior. If you have specific questions about these items, please contact MaineStay Vacations. Bottled Water- All of our properties have private wells, so you may prefer bottled water. Soaps & Detergents- We do not provide dish soap, sponges, inside trash bags, paper goods, and toiletries. Some items are left by owners and previous renters and can be used. We recommend that you check the property for these items before purchasing them at your local store. Paper Towel & Toilet Paper- You will receive a complimentary roll of paper towel and toilet paper when you arrive, as well as a trash bag to get you started, but all guests are responsible for these items during their stay. Linens- If you did not rent our service, please do not forget to bring sheets, towels, bath mats, and kitchen towels. Beach Towels- Our linen service does not provide beach towels, so please remember to bring them with you. Beach Chairs- We do not require our owners to provide chairs for the beach. Propane Tanks- For our homes with gas grills, all propane tanks are filled at the beginning of the season by owners and we ask our guests to please refill tanks that they empty and we will reimburse you for that expense. PLEASE DO NOT LEAVE EMPTY PROPANE TANKS FOR THE NEXT GUEST.